As the launch date for Committed gets closer, the trailer that we launched a few days ago is getting huge hits from all around the world. Urban Climber TV in America is currently running the trailer as their clip of the week, and judging by the votes and the comments on US forums it seems to be going down well. The trailer is also going up on lots of other climbing sites around the world. If you haven't seen it yet then you can view the Trailer here. 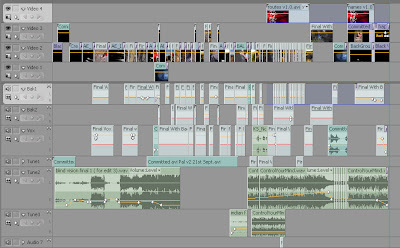 Making a trailer is probably the single hardest editing job in the whole of film production. The normal method for making a trailer is in fact, to get someone else to do it! Sounds odd, but that is how it is normally done; as a director or editor you end up so 'close' to your hundred hours of footage that sifting it down to 2 minutes is an impossible task. Last year Alastair Lee from Posing Productions put together the trailer of E11 for us (E11 Trailer). This year though, with all our film-maker friends up to their necks with their own projects, we had to go it alone, and it was hard work. ITV news (STV) in Scotland should be showing some 'Committed' clips of Kev Shields, tonight or tommorrow. So if you are in this part of the world then check it out.